Summary: Another copy of a known to fail automated binary robot. Today I’m reviewing another automated trading robot promising a $1000 free account, Xtrade Binary. The developers of this system claim that it is an award-winning trading platform that won best binary robot in 2016, the Tech Finance Journal Awarded in 2015 and the iFX Expo Asia Award in 2016. None of these awards can be verified, or found anywhere online, so proceed with caution if this is the main element that has attracted you to the software. There is no information on the company behind this product and they also do not provide any access to support via email or phone. This is not a good sign, as any real binary options product or broker will always have contact information available. The sales page for the XTrade Binary software may come across as very familiar, because you’ve likely seen a lot of these elements in the past. This seems to be another reiteration of a product we’ve seen many times already in the past. All of their sales pages of the same, because they are selling the exact same white label software. I would have no problem with this course of action of the software was actually profitable, but it’s not. We’ve seen this system hundreds of times and it has never earned anyone a penny. In fact, there isn’t a single automated binary options tool on the market to consistently grow accounts, despite hundreds being released every month. This is essentially the exact same software as the FinTecBot, Trade Bot Plus, and many others. Each and every one of them show us the same results section, and advertise 6 basic indicators without ever telling us their influence on the trading strategy. The reason we are told about the strategy and how these indicators play a part, is because the people behind the software aren’t actually binary options traders. The only different part of the XTrade Binary sales page is the placement of their testimonials. This is located in a section labeled Top 5 Gainers in May 2017. In this section, there are 4 different traders and each shows a different number of trades, all-time return on investment and win rate. The win rate statistic doesn’t make a lot of sense to me. This software is advertised as a fully automated system but for some reason these traders all have different win rates. If they are all using the exact same automated trading system, they should all have the exact same win rate. Obviously, there would be differences in win rate based on when a trader started using the software but 2 of the traders have the exact same number of trades but there win rate and all time return on investment are both 10% different. The results are certainly linked to some sort of the script that randomly shows us a bunch of trades in nearly always shows 8 out of 10 winners. They never show us the expiry time, the amount invested, and the open and close prices are never even close to where the market actually is. These results cannot be trusted. 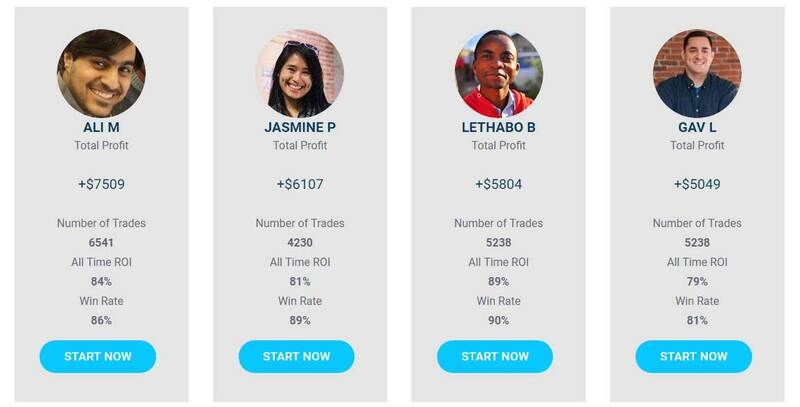 I don’t recommend anyone signs up with XTrade Binary because this is clearly another automated binary options software that’s just trying to make a quick buck off of unsuspecting traders. The developers of this software are not traders in their own right, but just marketers looking to exploit the binary trading community. They can try all they want, but I won’t allow it. For Binary Options Software you can trust, go here.